Welcome - Come Join the Fun & Adventure! Welcome to Troop 140's website. We are an active Scout Troop serving the Scouts of Watertown and Oakville. Our Troop meets every Thursday night from 7 PM - 8:30 PM in the St. Mary Magdalen Church Hall between the 1st Thursday in September and the 1st Thursday in June. Mission Statement: The mission of the Boy Scouts of America is to prepare young people to make ethical and moral choices over their lifetimes by instilling in them the values of the Scout Oath and Law. A very special thanks to Mrs Grendzinski and Ms. Mancini for putting the raffle together at our Homefront pasta dinner. Mr. D. and Mrs Ralicki for donating raffle items. Thank You Scouts who helped Mr. Maysada load his truck up after the Dinner. Not sure what we raised but it looked like a good turnout. We need to raise $2,500.00 to do project. Thanks to all Again!!!!!!!!!!!!!!!!!!!!!!!!!!!!!!!!! Mothers Day Flower sale has begun. Orders must be in by Thursday April 25th. They are 23.00 dollars each. Mr. DiFederico has planned a great trip to the Cape on your Easter break. You will be staying in a nice cabin Camp Greenough Scout Reservation.Visit Maritime Museum, Army Navy Store Provincetown, Cape Cod potato Chip Factory, Bournedale Herring run, lookm for whales. You will biking on the Cape Cod trail which is as flat as you can get.There will be chase cars in case you feel need help. The Connecticut Rivers Council believes all Scouts should have the opportunity to attend Summer Camp, no matter their financial situation. 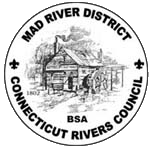 Therefore, the Connecticut Rivers Council is pleased to offer camperships to Scouts who attend a Connecticut Rivers Council Camp.The deadline for submissions is April 1st 2019. Any campership applications recieved after April 1st will be put into a pool for consideration of any remaining funds. Please go to the Ctrivers web site and fill out "Scout Resident Campership Form". Boy did we pick up some litter. This is the worst I have seen it. We definitly needed more people.Jake, Dillan and Hunter cleaned out all our 57 birdhouses. A few had some cute mice. We planted some rose of Sharon and Yucca plants. Removed tires and debris from water. While we were cleaning along highway someone threw a complete newspaper out of their car window. We found tons of nips bottles. The up side of the day was that many motorist honked their horns to thank us and many of the younger scouts could not believe there was so much litter and how could people litter with such ease. Great Job Thursday night with animal Identifaction. You all did a bang up job with your presentations. I know I learned a few new things. At our next meeting April 11 we will make animal tracks and then you will all be able to get signed off on Identifying 10 animals.